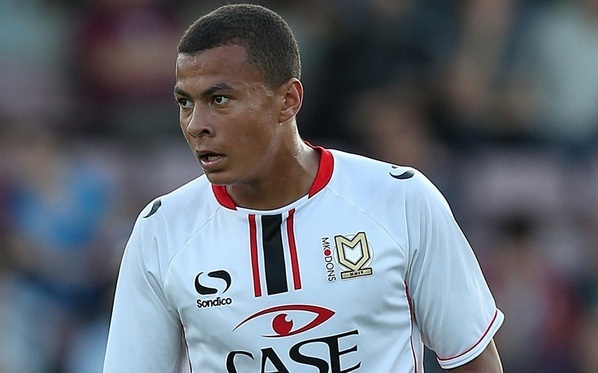 The Sunday Sun is reporting today that Newcastle are still interested in signing 18 year-old 6′ 2¨tall MK Dons central midfielder Bamidele Jermaine Alli, better known as Dele Alli. Newcastle were first linked with this player at the beginning of the year, and the news is that the Tyneside club want to sign the Milton Keynes born youngster in the summer. Dele has played for the England U17 side 9 times, twice for the U18 side and four times for the U19s, and the plan would be that he would initially be part of the Development squad. Since then the 6’2¨ attacking midfielder has played a total of 62 times for his club with 15 goals, and this season he seems to be in excellent form with 8 goals in 18 appearances. Alli only turned 18 in April, and the right-footed player would be one for the future, but that’s what Ayoze Perez was, when he signed for us in the summer from Tenerife. And Ayoze this season has proved that at Newcastle, if you are good enough, you will be given a chance in the first team. Alli extended his contract last September at the MK Dons to June of 2017, so Newcastle would need to pay out some money for the youngster – exactly how much we don’t know – but he already looks a skillful and composed player. Deli Alli is exactly the type of young up-and-coming player Newcastle should be signing, and here’s some video of the teenager. Another Argentinean anyone? Forward Luciano Vietto plays for Villareal has 4(2assists) in 12 in LaLiga and 4(4) in Europa. although coming from villareal he will have had an excellent grounding as it’s one of the best run clubs in spain. Newcastle Squad: Elliot, Alnwick, Janmaat, Dummett, Williamson, S. Taylor, Streete, Haidara, Tiote, Anita, Cabella, Gouffran, Ameobi, Riviere, Cisse, Perez, Armstrong, Ferreyra, Satka, Woodman, Abeid. I quite like it, in a sick way. It’s better than guessing who’s getting sold to who. wolfshead got it right earlier, catchy and rotunda can smell blood tonight and are getting their presence felt so nobody can accuse them of only posting after a loss. Incredible ! I hope King Percy does not rush back any injured players tonight. He should only pick players if they are 100% fit. The consequences are obvious – players out for an even longer period. Mister Tuff – plus it is not a confidence boost to the players waiting for their opportunity. 70 – yes as you say some players only get their chance because someone else is injured. What might be a “lesser” injury could become worse playing someone too early. about childish comments that certain bloggers post about King Percy and Mr Tubbs, this is in addition to posters having blog names which he does not like. Introducing a bit of humour/skit/banter has always occurred when folk talk about football, whether is is at the match, at the pub or on the blog. For someone to have the audacity to want to deny a bit of humour for others because he does not like it, to me is unbelievable and to post that he does not like it is even more amazing. We should all have the ability to laugh at ourselves or sometimes have a laugh at what we believe and certainly to have a laugh at persons in “officialdom” – it’s the British way. Commissar SITC c/o Goolag 19 Russia. Isn’t that the real name of the invisible man? Can’t believe the amount if upset my mickey taking of Alans fashion glasses caused. Comrade Jail – you vill come to zee corner and sing zee songs I tell you to sing. 70two -@ 4 Yep, we’ll have him, providing he scores one of them every 2 weeks minimum!! So does anyone know who is and is not actually available for tonight? Cabella better be starting tonight, it’s Burnley for crying out loud we need to be on the front foot from the kick off. The longer it stays at nil nil the more confidence they’ll get, ings only needs a couple of chances. Other than that I see very little threat, arfield and Boyd are clever on the ball but will leave space for our attackers. So cabella should thrive given chance. I’ve kept quiet for a long time and then you rather bizarrely just come out with some totally random statement like that. You gave us a brief respite from Ashley, changed horses and have been critical of pardew even during the recent good run. Very odd. I want is to win tonight, especially if we have some youngsters playing, as they seem to offer us more than Pardew’s favourites, who get games regardless of form. I am wary that west ham was a throwback to when we were in the bottom 3 when gouffran was brought in at left mid in a 4231, sissoko was pushed out wide and willo hoofed it endlessly. Yes that does concern me but I take no joy in it whatsoever. I just wish pardew was consistent but he has shown he is just as capable of a good run as a bad one and just when you think he ”gets it” he does a west ham type result on you for no logical reason. Just been reading the story of Darlow impressing Tim Flowers at Forrest. Will Elliot be the one to leave, I don’t really think anyone will come in for Krull. Then we have Alnwick, maybe he’ll go on loan. We’ll have four keepers so ones off. I think Elliott is almost certain to leave as he wants playing time so Darlow will be number 2 I suspect. On another note. Good new. Lawro has us to loose and he’s always wrong. I assure you I have not changed horses, I am opposed to Mike Ashley as I have ever been only I got sick of Pardews terrible football and results and realised he could not hind behind Ashley policies any longer. People are saying Burnley will be bouyed by our injuries. Lets hope they are too buoyed and underestimate our kids. Or just let Cabella get at them. If anything than for a good practice session. Anyone reckon we should just play Gouffy at LB if Santon and Haidara are injured? Probably see him in goal if the modern man has a baby tonight. will the match b on stream or only radio? ???? Did men not have babies back in the day? Hold the hate mail on Gouffy. He has been asked to play different roles and that has affected his play. He’s still a good footballer who hardly ever loses the ball cheaply and puts in a shift. If you must blame somebody blame his boss. He wasn’t the cause for our poor run, maybe a symptom. We must beat Burnley, surely. Even with Beardo’s team. PS. Vuckic still can’t get a look in or is he injured? How about that Chucky dude? You have indeed kept quite for a long time, leaving people who were not perhaps so consistently vocal as yourself to cop it when the inevitable backlash came. I believe that the repetitive Pardew baiting during the bad run created the conditions for the trollery we have all suffered since. When I say all of course, I don’t mean you, as you kept your head down. I hope we win tonight, not least for the thousands making a cold Tuesday night trip across the Pennines. I actually defended his selection against west ham and still maintain it was the smart call over Cabella. That said what worries me is that he seems to absolutely bottle it in front of goal. He is meant to be a second striker. Hope Cisse (our top scorer btw), grabs a couple. Not exactly sure how babies were born before modern man got the jist of it, you’d have to ask our former glazier as it is one of his wisdoms. For today I am beyond caring who starts as long as Cabella gets a chance. I wont be too critical if we loose as we are really up against it. I fear this could be the last time in a while I am on here though given the run we could be about to go on and the way it gets on here.